ANGEL Pantoja Medina is dead. That’s him leaning on the wall for his three-day wake. 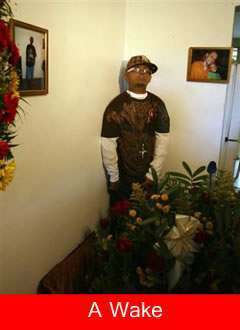 Angel Pantoja Medina is dressed in a Yankees baseball cap, sunglasses and baggy pants. And right it is that a young blade should be on the bleeding edge of fashion. Lillian McIntyre’s nurses started the tend and now the 24 year old former Puerto Rican has bitten the fashion bug for new angles in death. But who’s happy standing, when you can sit?